Over the past two years, states along the U.S. East Coast have announced increasingly ambitious targets to build offshore wind projects. In January of this year, to cite the most consequential recent example, New York nearly quadrupled its offshore wind target to 9,000 megawatts by 2035. But what do the gigawatts’ worth of state-level commitments mean for companies unsure whether to commit resources to become part of the supply chain for offshore wind projects? 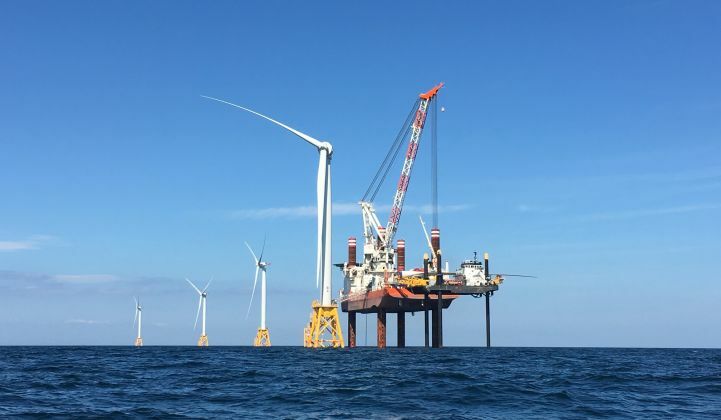 A new report from the Special Initiative on Offshore Wind (SIOW) at the University of Delaware aims to provide “first-of-its-kind granularity” into the U.S. offshore wind supply chain. The report forecasts 18.6 gigawatts of U.S. offshore wind procurements through 2030, which represents a $68.2 billion opportunity for suppliers. Potential supply chain investors need “a much greater level of clarity and transparency on the U.S. market and how it is likely to unfold, especially in the near term,” Stephanie McClellan, SIOW director and report author, told Greentech Media in an interview. In addition, the market is likely to see $5.3 billion invested in marine support, insurance and project management activities. The report provides a state-by-state, year-by-year forecast for offshore wind power contracting. Connecticut and New York, for instance, are each forecast to schedule procurements totaling in the hundreds of megawatts every two years through 2030. “We were responding to the supply chain’s need for that kind of information, so they can go back and make the business case to their companies, to their management,” according to McClellan. “The offshore wind industry has been a black box for many U.S. companies,” said Liz Burdock, CEO and president of the nonprofit organization Business Network for Offshore Wind, in an email. We often associate artificial intelligence (AI) and machine learning (ML) with exotic applications – self-driving cars, speech and facial recognition, robotic control and medical diagnosis – all powered by massive rows of servers filled with CPUs or GPUs, at some distant data center. But in fact, AI and ML are getting closer and closer to all of us. That’s because companies such as Google, Microsoft, Nvidia and others have recently introduced technologies, platforms and devices that can cost-effectively extend AI and ML capabilities to the edge of the network. Working in concert with cloud services, these devices are capable of processing large volumes of data locally, and enabling highly localized and timely “inference,” industry jargon for AI- and ML-driven predictions executed at the edge after having been trained in the cloud; where data storage and processing power are plentiful and scalable. security and data privacy can be enhanced by keeping sensitive data on the device. Coral is Google’s new developer platform for local AI. It is powered by the company’s Edge TPU (tensor processing unit) chip and is specifically designed to run machine learning models for edge computing. Coral features a tiny integrated circuit on a credit-card sized development board surrounded by an aluminum housing, with a USB connection to any Linux-based system. In other words, everything a developer needs to prototype applications for on-device machine learning inference. 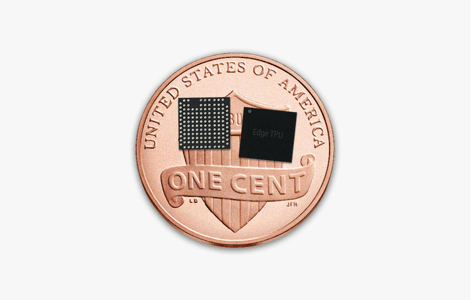 Small, but powerful: two Google Edge TPUs on a penny. Coral provides a perfect illustration of how cloud and edge work together to put intelligence where it’s needed. The heavy lifting for developing a machine learning model and its subsequent training happens in the cloud where massive amounts of computing and processing power are needed to refine the vast amounts of data required to develop a proper deep learning model. The result of this training is then compressed and distilled into smaller and faster applications that can be applied quickly to new data at the edge using specialty hardware designed to perform this task. Google’s initial performance benchmarks for an image classification application with a remote camera using edge AI show a 70-100x faster performance than a CPU-based approach. Speed and low-latency will be key criteria for utility grid management using AI and ML. Bringing this technology to the power grid domain requires expertise in developing specific use cases and applications that would deliver new value to utilities. Many industry vendors – from smart metering to distribution automation to demand response – are beginning to integrate edge intelligence into their product lines. But as many are finding out, this is a complex endeavor, both technologically and culturally. By engaging with vendors and system integrators to communicate their requirements and define their use cases for edge intelligence, utilities are in a position to drive a technology revolution in the industry that will unlock new benefit streams and empower customers with more energy choices. The more data that is collected in the cloud, the better the training models become, resulting in a smarter, faster and more accurate inference – all of which enables edge intelligence to be a true business differentiator for utilities. There’s a lot that governments can do to connect disadvantaged communities to economic opportunities. For decades, many state and local officials have thought that they had to choose between developing their economies and protecting the environment. But the reality is that we have an opportunity to do both, creating jobs in struggling communities while building green, resilient 21st-century infrastructure. To make that happen, though, we need the right contracting and procurement policies in place. The litany of challenges is familiar. Our infrastructure is deteriorating, just as climate change places new stresses on our aging roads, dams, sewer systems and power plants. And the much-vaunted economic recovery has left too many people behind, especially in communities of color. State and local governments play an increasingly important role in infrastructure construction. Each year, they spend at least $250 billion on public infrastructure, including transportation, energy and water/sewer system upgrades. But a recent report by the Emerald Cities Collaborative and PolicyLink shows that infrastructure spending will not automatically “lift all boats,” especially in historically marginalized communities. The report highlights the multi-layered challenges that minority-, women-, disadvantaged- and veteran-owned business enterprises (or MWDVBEs) face in competing for infrastructure contracts. To overcome those challenges, governments must be purposeful about connecting local and underrepresented businesses to economic opportunities. That’s where inclusive procurement and contracting comes in. • Prioritize local procurement, especially for underrepresented businesses. Small and medium-sized local businesses, those with fewer than 500 employees, are major engines of job growth. In fact, nearly half of the nation’s private sector is employed at a small business, and small businesses are responsible for two out of three net new jobs. They are the secret sauce for spurring the local economy. But these enterprises are often cut out of infrastructure contracts, which favor large prime contractors. That’s doubly true for MWDVBEs, which bear a legacy of discrimination in lending, contracting and business ownership. To level the playing field, states and localities should ensure that infrastructure investments give priority consideration to local contractors, including those historically excluded from public-sector opportunities. • Adopt accessible project delivery methods. Water, energy, transportation and other climate-resilient infrastructure projects are large-scale, multibillion-dollar, long-term endeavors. The process for bidding on these complex projects has become increasingly difficult for smaller contractors. More than three dozen state legislatures have given local governments authority to use public-private partnerships and other innovative project delivery methods to help cut the time, cost and the complexity of these projects. But P3s can undercut local economic development goals. Because they are designed to maximize efficiency and investment returns, P3s tend to bid out large contracts to national or international firms rather than “unbundling” bids to match the capacity of smaller, local contractors. One alternative is for public authorities to move beyond low-bid methods to values-based contracting, in which local procurement is one of the articulated project goals. Governments need to ensure that these goals are embedded in the program design and throughout the construction process. • Build a robust small-business ecosystem. Finally, success requires improving support systems to help local businesses effectively compete. This includes streamlining the multitude of local, state and agency certification programs and sharing regional data on MWDVBEs available to collaborate on large projects. It is also critical to increase small businesses’ access to bonding, insurance and capital; prime contractors can be awarded extra points for helping their smaller subcontractors obtain these essentials. In addition, a small assessment on an infrastructure project can readily capitalize collateral pools to provide credit enhancements for small contractors. Of course, these strategies run the risk of modestly increasing program costs. But if the axiom that “you get what you pay for” is true, then-if you want good jobs for local residents-you will have to pay for it. With major new infrastructure investments on the horizon, state and local governments are uniquely positioned to put the jobs-vs.-environment myth to rest. The DCPSC approved in part Pepco’s Application for a Transportation Electrification (TE) Program (Formal Case No. 1130, Order No. 19898). The DCPSC allowed Pepco to deploy infrastructure to support 55 public electric vehicle (EV) charging stations and additional infrastructure to support the charging of electric taxis, rideshare vehicles, and buses. This action fosters the expansion of a competitive EV charging market in the District, and helps to achieve the District’s clean energy plan and climate change commitments. Additionally, the Order includes approval for the rollout of a Residential Time-of-Use rate for home EV charging, which will encourage the charging of EVs at off-peak hours — a critical element of any successful TE initiative. The DCPSC will monitor these programs, as they are implemented, and study the effects of TE on the electric grid as the EV market expands. Five years ago, the District Government released a plan to make the District of Columbia the most sustainable city in the country. At the time, the Sustainable DC plan was one of the most innovative, ambitious sustainability plans in the country. While the District remains at the forefront of innovation in sustainability, a lot has changed in the past five years. We have seen major economic, political, and social change in the District and across the country, and we need a sustainability plan that reflects the reality of 2018. We need a plan that takes advantage of new opportunities and addresses new challenges that have arisen—a plan that meets the needs of our changing city and the 700,000+ residents who call the District home. That is why I directed my team to update the Sustainable DC plan into a strategy for 2018 of which we can all be proud. I call it Sustainable DC 2.0. Sustainability planning can not happen in a vacuum. Sustainable DC 2.0 focuses on making the District the healthiest, greenest, most livable city for all District residents, but there are many forces at play in the city in which that work is happening. The population of Washington, DC—both in how many people and who lives in the District—is rapidly changing. The population of the District is projected to reach almost 900,000 by 2032, the final year of this plan’s scope. The demographics of Washington are also changing. Known for decades as “Chocolate City,” DC is now just 47 percent black. 4.3 percent Asian. Increased diversity brings new opportunities and benefits, but also brings new challenges for many residents. While Washington, DC is one of the best educated cities in America and enjoys a relatively high median household income of almost $73,000 (compared to the national average of $55,000), prosperity is not enjoyed by all residents. In 2017, the median household income in Ward 8 was $32,000 while in Ward 3 it was $110,000. Almost 17 percent of District residents live under the poverty rate. Ninety-four percent of white residents hold a bachelor degree or higher education while only 36 percent of black residents do. While the District Government has made affordable housing a top priority, the pressure of rising housing costs is felt by many residents: more than 40 percent of District residents spend over a third of their monthly income on housing costs. we will need to adjust our strategies as Washington, DC continues to change. If you have any suggestion for how to implement one of the actions, your advice would be appreciated. will require the ideas and energy of our entire community. I invite you to get involved at www.sustainabledc.org. The Sustainable DC 2.0 plan is broad. It contains 167 actions and 36 goals across 13 separate topics. This document has been designed to be read either cover-to-cover if you are feeling ambitious or as individual sections if you are interested in a specific topic. If you would simply like a summary of what each topic covers, a time frame for implementation, and which District Government agencies are responsible for implementation, you can turn to the chart at the very end of this document. If you come across acronyms or a term you are not familiar with, you can flip to the list of acronyms or glossary in the back for a definition. Also, note that while the plan is largely written in the future tense, much of the work is already underway. Each of the 13 topics is organized into distinct goals, targets, and actions. Here’s what they mean: GOALS are big picture, overarching ambitions. ACTIONS explain how the District will reach each of the targets. Each goal usually has four or five targets. TARGETS are the quantifiable method of tracking progress towards the goal. Each goal has one target. The College Underserved/Community Partnership Program (CUPP) was created to provide a creative approach to partnering and delivering technical assistance to underserved communities from local colleges and universities. CUPP enlists colleges and universities, with appropriate programs, to assist these underserved communities, with vital technical support, through student internships and capstone projects. Students work on a range of plans and projects that help communities gain access to resources that can improve the economic future and overall quality of life for the community. At the same time, CUPP provides practical experience for participating students in their areas of academic study, and students generally receive academic credit for their efforts. The communities receive vital services at no cost, and the schools provide their services at no cost to the federal government. The program began with four schools in the fall of 2013, 14 in the fall of 2014, and 35 in the fall of 2015. The CUPP program currently has 71 schools, aligned with 64 different communities. As of June 2018, we have provided over $15,560,000 of support to communities. We are working to add more collaborative partners. CUPP works to encourage colleges and universities to give students the opportunity to provide a variety of technical support to underserved communities, based on community identified needs. This assistance enhances the communities’ ability to gain access to the resources needed to move their communities forward economically, environmentally, and provide better health outcomes. At the same time, the program provides valuable practical experience for college and university students in their areas of academic study. The work done by the schools is provided on a voluntary basis, but the experiential learning opportunity given to students provides a two-fold benefit: it makes their academic work more meaningful, and gives them practical experience that improves their post graduate work opportunities. For the communities, CUPP gives them an opportunity to compete with larger cities for resources. For the federal government, it helps smaller communities compete for federal resources, thereby improving the diverse distribution of federal assets. The City of Riverdale, GA is challenged with retaining public safety officers and other staff residing within its boundaries. To address this issue, a student project is assisting the city in developing a program to fund, rehab, and resale of property to city employees as a retention incentive. The project’s goals include identifying, assessing and cataloguing the quantity and condition of abandoned and vacant houses for restoration. This will also include a preliminary assessment of environmentally hazardous materials including lead and asbestos. This project has also served as a pilot for the use of federal work study funds to provide stipends for eligible students, enhancing their post-graduation opportunities. Federal Work Study funds are now encouraged to be used to support participation by students who previously were financially unable to participate in the CUPP Program, opening participation by thousands more students. Developed partnership between San Juan College (tribal), Farmington, NM, and Drexel University, Philadelphia, PA, to develop a maker space for San Juan to spur entrepreneurial activities (economic development) in Farmington, NM, which has one of the highest unemployment rates in the United States. In addition, developed a partnership with the American Geophysics Union’s Thriving Earth Exchange (TEX) and San Juan College in New Mexico to develop a curriculum to educate students in alternative energy, which will be incorporated in the design of the maker space.Completed project has reenergized the city of Farmington, and hundreds of thousands of dollars have been raised to equip the space for future use. For more information, please contact Michael Burns (burns.michael@epa.gov), CUPP Program Lead. You are Cordially Invited to the 2019 District Sustainability Awards! Join DOEE Director Tommy Wells to honor this year’s District Sustainability Award winners, which include local nonprofit and educational organizations and private sector businesses – and an award for “People’s Choice.” This year, the city will also recognize the first winner of the Clean Energy DC Award. District Sustainability Award winners support the Sustainable DC Plan goals in areas of energy and water conservation, green building/construction, healthy food access, solar energy production, triple-bottom-line programs, stormwater management, and sustainable waste management. Green carpet and doors beginning at 5:30, followed by opening remarks, so please be sure to arrive on time and ready to celebrate! There is limited street parking available; please consider taking public transit to the event. Eastern Market is located two blocks North of the Eastern Market Metro stop (Orange, Silver, and Blue Lines). Several Metrobus lines also service the Eastern Market Metro stop. If you have any questions, require a sign language interpreter, or ADA accessibility assistance, contact Mary Lynn Wilhere at (202) 535-1939 or marylynn.wilhere@dc.gov. Este documento contiene información importante. Si necesita ayuda en Español o si tiene alguna pregunta sobre este aviso, por favor llame al (202) 535-1939. Infórmele al representante de atención al cliente el idioma que habla para que le proporcione un intérprete sin costo para usted. Gracias. Take action to extend the federal EV tax credit! Tell your representative and senators to support the Driving America Forward Act! Finally, we have bipartisan legislation in Congress that supports extending the federal electric vehicle (EV) tax credit to work for more drivers for a longer period of time. The current tax credit is capped at 200,000 vehicles per automaker, with Tesla and GM having already hit that cap. The Driving America Forward Act, introduced today, would raise that cap to 600,000 vehicles per automaker. The legislation is sponsored by Republicans and Democrats and has the support of the auto industry and a number of other key stakeholders. The extension of the vehicle cap will allow consumers to purchase the cars they want as the market continues to grow and mature. But we need your help to get more co-sponsors on the bill and to show Senate and House leadership there is strong support to pass this Act. Take action now to support extending the EV tax credit for American drivers. Thank you – please share this action alert widely! Published: Mon, Apr 15, 2019 2:55 pm info@greenthechurch.org Rev. Benjamin Carroll, is the Co-Founder of Carroll Ministries International and Pastor of Greater Antioch Missionary Baptist Church in West Palm Beach,FL. Rev. Carroll also serves as President of the Florida East Coast Baptist Association’s Northern Union. Rev. Carroll is also an active duty Major serving as a Chaplain in the U.S. Army. Earth Day is only a few days away and the selected theme for this year is, “Protect Our Species”. It is important to protect the migrating Monarch Butterfly or the Florida Manatee, but we must also be mindful of the plight of people of color who too are often left unprotected against the onslaught of community neglect and community decay. As we look forward to Earth Day, let’s take this opportunity to make sure we expose ourselves to the broad initiatives of what this important day means particularly for people of color. Animals and insects play an important role in creating balance in our ecosystems, neglecting them would mean devastation in areas often unknown to those who are not directly impacted. More importantly, those of the human species, Homo sapiens, specifically those whose skin has been kissed by nature’s sun are on the verge of extinction due to poor living conditions, polluted air, lack of adequate food sources and toxic drinking water being pumped through inner-city water systems. It’s time the Black church stood up and began to invest time and resources in launching a collective responsibility to ensure our congregations take our place in protecting the Human Species. We charge the African American Church to do its part by helping to mobilize your local church and surrounding churches to observe Earth Day, April 22nd and get involved in Earth Day advocacy initiatives. Resurrection Sunday is April 21st, the day we celebrate Our Lord and Savior Jesus Christ’s resurrection and victory. This is also a day we can celebrate the God of all creation by thanking Him for His precious gift of creation and ALL that dwell therein. We encourage congregations to go above and beyond to make your Earth Day service moving, g, and inspirational. Earth Day is only a few days away and this year our theme is: “Protect Our Species”. It is important to protect the species such as the migrating Monarch Butterfly or the Florida Manatee, but we must also be mindful of the consequences that communities of color face because their environmental plights aren’t well known. As we look forward to Earth Day, let’s take this opportunity to make sure we expose ourselves to the broad initiatives which fall under the rubric of what this important day means particularly for people of color. Animals and insects play an important role in creating balance in our ecosystems, neglecting them would mean devastation in areas often unknown to those who are not directly impacted. Those of the human species, Homo sapiens, whose skin has been kissed by nature’s sun are in danger due to poor living conditions, polluted air, lack of adequate food sources and toxic drinking water being pumped through inner-city water systems. It’s time the Black church stood up and began to invest time and resources in initiating a collective responsibility to ensure that our congregations take our place in protecting the Human Species. We charge the African American Church to do its part by helping to mobilize your local church and surrounding churches to observe Earth Day, April 22nd and get involved in Earth Day advocacy initiatives. Resurrection Sunday is April 21st, the day we celebrate Our Lord and Savior Jesus Christ’s resurrection and victory. This is also a day we can celebrate the God of all creation by thanking Him for His precious gift of creation and ALL that dwell therein. We encourage congregations to go above and beyond to make your Earth Day service moving, enlightening, and inspirational. Check out our Earth Day Toolkit for some ideas and resources. Interview With Dr. Unique Morris-Hughes, Director of the D.C. Department of Employment Service As Speaks about the DC Infrastructure Academy. The District of Columbia Infrastructure Academy (DCIA) is a key initiative of Mayor Muriel Bowser’s Administration, led by the Department of Employment Services. Infrastructure is one of the fastest growing industries in the country. DOES has opened the DC Infrastructure Academy to meet the need for skilled infrastructure professionals in Washington, DC. DCIA coordinates, trains, screens and recruits residents to fulfill the needs of the infrastructure industry and infrastructure jobs with leading companies in this high-demand field. DCIA is located in the Anacostia neighborhood in Ward 8. For more information about opportunities to partner or to register for training call 202-899-6040 or email DCIA@dc.gov. I would be interested in discussing your project with you. I may not be the most knowledgeable person to interview on this subject, but I do have a lot of speaking experience (as you can see from my signature, below). I also have solar panels on my house, but I am not in DC at present, so it partly depends on how you want to conduct the interview, technically. Thank you very much for reaching out to the DC SUN list serve. Adjustment (BZA) in support of this appeal. MD is moving to 100% clean electricity by 2040. Thank your legislators! I’ve been waiting for WEEKS to give you this good news: We won! Today, on the last day of the 90-day session, the Maryland General Assembly finally passed the Clean Energy Jobs Act! You heard that right!! Two veteran legislators — Senator Brian Feldman of Montgomery County and Delegate Dereck Davis of Prince George’s County — rescued the bill, garnered the votes, and played star roles in final passage of the strongest climate legislation Maryland has ever embraced. They were helped by freshman Delegate Lorig Charkoudian (D-Montgomery) who played a critical role as “floor leader” during the House debate, a rare honor for a first-year legislator. This victory took 90 full days of intense advocacy and struggle in Annapolis. It took letters from climate scientists, rallies by solar workers, and countless phone calls and emails from residents like YOU. But now Maryland joins the exclusive company of California, Hawaii, New Mexico, DC, New Jersey, Vermont, and New York as the states with the highest clean-energy goals in the nation in the fight against climate change. Now, won’t you take five minutes to say thank you? Click here to show your appreciation to Senator Brian Feldman, Delegate Dereck Davis, and other Maryland leaders for passage of the Clean Energy Jobs Act. Our state will now be powered by 50% renewable electricity by 2030 and will develop a mandatory plan to get to 100% clean power by 2040. The legislation will transform the way electricity is used in our state, making roof-top solar power and utility-scale solar common forms of generation in coming years. It will also further kickstart the state’s offshore wind industry, with incentives for 1200 megawatts of ocean-based power. On the negative side, legislators could not muster the votes to end subsidies for waste incineration under the state’s renewable power standard. This is a bitter setback in an otherwise radically strong bill. We at CCAN will continue to work with local leaders to shutter the large trash incinerators in Baltimore City and Montgomery County and move to a zero waste economy. It is WRONG to subsidize trash burning as clean energy. Period. But the combined positive results of the Clean Energy Jobs Act are stunning. The bill will create tens of thousands of new solar and wind jobs, will create billions of dollars in net economic expansion for the state, and will invest millions in minority-, women-, and veteran-owned clean energy businesses and worker training programs. The total pollution reduction benefits are equal to taking 1.7 million cars off of Maryland roads. The Maryland House of Delegates and the Senate both provided veto-proof majorities to pass the Clean Energy Jobs Act today: 95-40 in favor in the House and 31-15 in the Senate. But I’ll be honest, this year’s General Assembly session has felt like running a marathon. It has been HARD. With the whole state of Maryland cheering us on, we gave it our all. And, as always, victories don’t happen without YOU. You helped us generate hundreds of calls and emails to your leaders in Annapolis. You came to rallies and lobby nights. Finally, it has paid off. Now that the Clean Energy Jobs Act has passed, it will go to Governor Hogan’s desk. In 2016, Hogan vetoed an earlier version of the Clean Energy Jobs Act getting us to 25% renewable electricity by 2020, and we had to override his veto the following year. Meanwhile, on the trash incineration issue, we were bitterly disappointed by the outcome. But we were totally inspired by the community activists in Baltimore City and Montgomery County who fought so hard — including a powerful lobby night in Annapolis — to bring justice to this incineration issue. The battle is not over. We will be back! But for now, let’s thank our Delegates and Senators for all the good in the Clean Energy Jobs Act. Great bills don’t happen without great leaders. Click this link to send a big thank you to Senator Brian Feldman, Delegate Dereck Davis, and the other Maryland leaders who moved this bill to victory. Unfortunately, another major bill we fought for did not pass this year. Following a two-year-long campaign led by community activists fighting TransCanada’s Potomac Pipeline, we introduced the Pipeline and Water Protection Act (PAWPA). This bill would have required the Maryland Department of Environment (MDE) to always conduct a water quality review under the authority granted by section 401 of the Clean Water Act. MDE failed to conduct this review for the Potomac Pipeline, and the project was ultimately approved. Thankfully, the Board of Public Works voted unanimously 3-0 to deny one final key permit, but it’s likely that TransCanada will sue to start construction. We were so excited when the Senate Education, Health and Environment committee voted 7-4in favor of PAWPA. Unfortunately, the House Economic Matters committee voted it down. We will continue to work with the Maryland Department of Environment to improve transparency and public participation, and ensure they do everything in their power to protect our environment from the dangers of fracked-gas pipelines. But back to the good news. We are hoping Governor Hogan signs the Clean Energy Jobs Act by mid-May. Thankfully, we have seen a shift in tone from Governor Hogan’s administration since his 2016 veto of a similar clean energy bill. Last December, he co-wrote an op-ed in the Washington Post calling on states to lead the way on climate change. And his own administration modeled the Clean Energy Jobs Act when searching for ways to meet our 40% greenhouse gas reduction obligation. We’re hopeful he will do the right thing and sign the bill when it comes to his desk. We’ll keep you posted! Thanks again. following is a contributed article by Jim Matheson, CEO of the National Rural Electric Cooperative Association. But, the commission’s storage rule and DER aggregation proposal omit important language adopted by FERC in an earlier rulemaking to allow demand response aggregations only with the authorization of the relevant electric retail regulatory authority, typically a co-op board or state regulator. Rep. Mike Doyle, D-Pa., on Thursday introduced legislation long awaited by clean energy advocates: a tax credit for energy storage technologies. H.R. 2096 aims to make energy storage technologies fully eligible for the investment tax credit (ITC) that is currently available to solar and some solar-plus-storage projects. The solar ITC is set to phase down from 30% in 2019 to 26% for projects that start in 2020, 22% in 2021 and 10% for all commercial and utility projects that start thereafter. More than 100 House Democrats signed a letter to Ways and Means Committee Chair Richard Neal, D-Mass., on Thursday, asking for a long-term extension of clean energy tax credits, including storage, alternative-fuel vehicles and energy efficiency-based provisions. The request follows efforts by the Trump administration to “undermine” the Environmental Protection Agency’s Clean Power Plan, according to the letter. While the Green New Deal is getting a lot of attention, Congressional Democrats are also pushing specific, near-term steps to address the challenges of climate change. On Thursday, House Democrats introduced legislation to increase deployments of clean energy technologies like energy storage. Over 100 Democrats also asked for clean energy tax policies to be added to any upcoming broader tax legislation or infrastructure package. “We are cognizant that Congress last extended many of these clean-energy tax credits with the understanding that they would eventually begin to be phased out,” the letter said, noting that the ITCs and other tax credits were meant “to serve as a bridge for the implementation of the EPA’s Clean Power Plan” to reduce emissions from coal-fired power plants and other carbon emissions reduction policies. “This is no longer the case. The Trump Administration’s efforts to undermine the CPP and other commonsense safeguards for new and existing power plants, relax fuel economy standards for cars and trucks, curtail potent methane emissions, and withdraw the United States from the Paris Climate Accords have fundamentally altered the framework by which the 2015 agreement was reached,” the letter states. Among the signatories is Rep. Paul Tonko, D-N.Y., who introduced a bill to challenge the president’s 2017 decision to pull the United States out of the Paris accord. In 2017, Doyle introduced a bipartisan bill to create a separate energy storage infrastructure ITC based on the existing tax credits for solar energy. This followed a similar effort on the Senate side, introduced in 2016 by Sen. Martin Heinrich, D-N.M., and former Sen. Dean Heller, R-Nev. Energy storage advocates expect a Senate version of the bill to be introduced during this Congress as well. The credit, which would be technology-agnostic, could further the investment and deployment in non-lithirum-ion batteries, according to the American Council on Renewable Energy (ACORE). Battery storage can be paired with generation, including wind, solar and gas to create a more efficient grid, according to Greg Wetstone, president and CEO of the ACORE. “For all the talk about resilience, this is the way to get there,” Wetstone told Utility Dive. If the storage tax credit is approved, project developers could start initial investment in a storage project and complete it within four years to qualify for the credit. Meanwhile, the interconnection queue for renewables and storage projects continues to grow and the U.S. grid is badly in need of more transmission infrastructure to add new capacity from clean energy developments. “Transmission is going to be critical to any of these ambitious proposals to get dramatic reductions in greenhouse emissions,” Wetstone said. For the past five years and counting, the Montgomery County Energy Summit has annually offered cutting-edge education focused on the latest trends in commercial energy efficiency, renewable energy, and related topics in Montgomery County. Our core audience includes building owners, property managers, energy contractors, and other green building professionals working in the County and the larger DMV area. This year’s event, which is themed “Focus on the Here & Now,” will include a keynote presentation, breakout education sessions, an Expo Area featuring the latest in sustainable products and services, breakfast and lunch, and a post-event reception. Our core audience includes building owners, property managers, energy contractors, and other green building professionals working in the County and the larger DMV area. PJM CEO Andy Ott is used to being at the center of the debate. In November, Ott appeared on the EPS podcast to talk through the details of a capacity market reform plan filed at FERC. “The game has changed” between the market operator and its state members, he said. Market participants are still waiting on FERC to rule on those controversial reforms, but the PJM staff is already preparing its next move. At the end of the month, the grid operator will file a proposal with the federal agency to reform reserve pricing in its energy market. Cyber insurance is vital for energy companies! Is your business covered? At Cyber Insurance Experts we perceive the significance of proper cyber coverage in our digital age. We tailor to each clients’ needs individually by quoting with multiple top-rated carriers. To address that, PJM’s reserve pricing proposal will institute a sloped demand curve that will allow prices to respond earlier as the system utilizes generation reserves. “We essentially run these generators every day for reliability … The question is what should they be paid? Should they be paid out of the market or in the market?” Ott said. Recorded this month at the CERAWeek conference in Houston, Ott also addressed PJM’s recent winter reliability report, which he said showed “a continuous improvement … in generation performance. The Puerto Rico state legislature adopted on Monday a bill that would set a 100% renewable portfolio standard (RPS) by 2050 as part of a broader package of energy reforms. The U.S. territory will join Hawaii, California and Washington, D.C., with its 100% RPS target, which includes interim goals of 40% renewables by 2025 and 50% by 2040. Similar to Hawaii’s island economy, Puerto Rico’s energy customers faced high prices from importing fossil fuels for power generation as well as resilience issues from extreme weather and vulnerable transmission infrastructure. SB 1121 was delayed after the House left session March 18 without approving the unified version of the bipartisan bill. The bill awaits Gov. Ricardo Rosselló’s signature. Puerto Rico has been rebuilding its grid following the widespread damage from 2017’s Hurricane Maria, which left 1.5 million residents without power for almost a year. The new package of energy policies seeks to advance the transition from baseload fossil fuel generation to distributed clean resources. The Puerto Rico Electric Power Authority’s (PREPA) integrated resource plan (IRP) shows “a very renewables-friendly narrative,” which “would have been unheard of before the storm, completely unheard of,” Javier Rua-Jovet, Sunrun’s Puerto Rico public policy director, told Utility Dive. That includes the largest solar and energy storage buildout in the United States. The addition of storage would address the intermittency of wind or solar, according to Jorge Camacho, a PREPA consultant and former regulatory staffer in Washington, D.C. The renewable resources are competing with liquefied natural gas (LNG), a cleaner imported fuel compared to diesel, oil and coal generation. “There is still an appetite in Puerto Rico for baseload, [and] to satisfy those baseload needs with gas,” Camacho told Utility Dive. EcoEléctrica, a private generator in Puerto Rico that imports LNG and burns it in a coastal 504 MW combined cycle facility in the south of the island, has “stellar performance,” Camacho said. However, their 25-year power purchase agreement is ending soon and the 100% by 2050 RPS mandate will lead regulators and other stakeholders to re-evaluate the length of a new contract, he said. “In order to get to 100% by 2050, you know you cannot go ahead and do another 25-year [contract] with EcoEléctrica, that doesn’t make sense, right?” he said. PREPA received criticism for including gas infrastructure in its latest IRP: three LNG import terminals. Connecting new resources to the grid can also be a challenge. The bill would establish hard deadlines for distributed solar interconnections: 90 days for medium-sized systems (25 kW to 5 MW) and automatic interconnection for small projects (under 25 kW). “Even though interconnection of a residential system to the grid should be really fast, it might take months and months and months [with] PREPA, and it has little to do with technical resources, it seems to have to do with administrative resources,” Rua-Jovet said. While Sunrun has had productive meetings with PREPA, “having a clear law helps because if at some point we find a roadblock, it might take going to the Commission” to resolve it, he said. As part of SB 1121, the Puerto Rico Energy Bureau will be able to establish performance-based metrics for renewable resource penetration. “Those types of metrics make sense when you have a more rational and, I guess, more private utility,” Rua-Jovet said. The bill would also ban coal plants starting in 2028. According to the Energy Information Administration, there is only one coal plant on the island, a 454 MW facility at Guayama. The North Carolina Department of Environmental Quality (DEQ) on Monday ordered Duke Energy to completely excavate all its coal ash ponds in the state. While eight of the utility’s 14 plant sites in North Carolina had been slated for full excavation and closure, the fate of the final six and their 11 ponds remained unknown until Monday. The closures were ordered after “rigorous scientific review” from the DEQ and public input from nearby communities concluded excavation is “the only way to protect public health and the environment,” the DEQ said. One of the six plants covered in the order is the Allen plant, which was named the second most polluted in the country in a national report from Earthjustice on coal ash pollution. Duke now has four months to file a plan with regulators on how it will comply with the order. Duke is spending billions to address coal ash pollution at its North Carolina coal plants and will now have to spend several billion more. The decision by North Carolina regulators echoes similar directives from state leaders and utilities in Virginia and Georgia, representing wins for environmentalists who argue the only safe way to protect groundwater from coal ash is to fully excavate the ponds and move the ash to plastic-lined pits or recycle it. Most utilities prefer the “cap-in-place” method. “We believe that the science and the engineering support that capping is protective of the environment,” Director of Policy and Environmental Communications at Duke Energy Paige Sheehan told Utility Dive. “And that’s … the analysis that we had submitted, to the state,” she added. Following the spill of more than 39,000 tons of coal ash from the utility’s Dan River plant in 2014, North Carolina lawmakers passed the Coal Ash Management Act (CAMA), amended in 2016 to direct the DEQ to examine the six of Duke’s coal ash sites not slated for excavation and determine next steps. The Monday order indicates the department does not find Duke’s cap-in-place closure plan sufficient for groundwater protection and the utility has until Aug. 1 to file a removal plan. Requirements by the state under CAMA dictate three main closure options: excavation and disposal into a lined landfill, cap-in-place method, or closure in accordance with federal coal combustion residual rules (CCR), which don’t necessitate a lining but have mandates on monitoring and how far away the bottom of the basin is from aquifers. Last November, Duke’s compliance filings under the federal rule revealed that 24 of its 26 coal ash ponds were in violation of CCR regulations governing disposal of the waste, including the basins’ distance from nearby aquifers. The ponds at the Allen plant — the second most polluted in the country — were found to be actively leaking cobalt more than 500 times above federal safety levels into surrounding groundwater, along with eight other pollutants, including arsenic, selenium and lithium. The only two ponds not in violation had been fully excavated. “Across the Southeast and more, as time develops, across the country, the industry standard now for addressing unlined coal ash pits is to remove the ash,” Frank Holleman, a senior attorney at the Southern Environmental Law Center, told Utility Dive, noting that the concern over many of the sites in North Carolina is their proximity to rivers and waterways. “This ash being saturated in water is going to continue to pollute the surrounding groundwater in which it sits as well as neighboring creeks, rivers, lakes and drinking water reservoirs, even if you cover it up with a synthetic cover and plant grass on top of it because they’re not getting the ash out of the groundwater,” said Holleman. The main concern for environmentalists and regulators with the cap-in-place method is that it leaves the bottom of the basin unlined and in contact with groundwater, and in many instances across the country, the heavy metal pollutants from the ash are leaching out around the site. Duke estimates costs to comply with the new order will add $4-5 billion to the current $5.6 billion clean up, covering construction and engineering as well as transporting the actual waste, said Sheehan. For some sites, closure could take over 30 years, she noted, and the closures will involve a mix of recycling the ash for concrete and excavation and removal. However, environmentalists also complain that utilities routinely overestimate the costs of removal. In Virginia, Dominion Energy initially reported removal costs would be between $2.564 billion and about $6.5 billion, while estimating cap-in-place methods would cost $2 billion on the high end. After the utility was ordered by legislators to reexamine the numbers, it found removal costs went down significantly to $2.773-$3.358 billion, if a single bidder were to recycle 45% of its ash over a 15-year span, or $2.345 billion to $5.642 billion if multiple bidders were selected. The table below outlines Duke’s November 2018 CCR compliance filings for the six plants subject to Monday’s order. Is the site compliant with federal CCR rules? Mayo Plant 3 No 4 Three violate 1.52 meters/5 ft above aquifer requirement, one violates wetlands impact requirements as well. Rogers (Cliffside) Plant 3 No/Yes 4 Two violate 1.52 meters/5 ft above aquifer requirement, wetlands impacts requirements. One is compliant with all CCR requirements. Roxboro Plant 2 No 3 Two violate 1.52 meters/5 ft above aquifer requirement, one violates wetlands impact requirements.